Hi lovelies! Today, I'm back with another healthy recipe for you and this time it's a super cheap, easy lunch idea. This time, like with my Chocolate Snack Bar post, it's Vegan once again. Like I said in that post, I'm not actually Vegan, but I do chose to eat vegan for some meals because it's good for you and I really enjoy it! You'll already know from the title that on today's menu, it's Sweet Potato and Chickpea burgers and sides. For the two sides, I made Broccoli and Cauliflower 'crisps' and Roasted Chickpeas. These are both fab sides for any meal as they're easy to make, super cheap and make a fab alternative to actual crisps if you're craving something crunchy. Let's go! 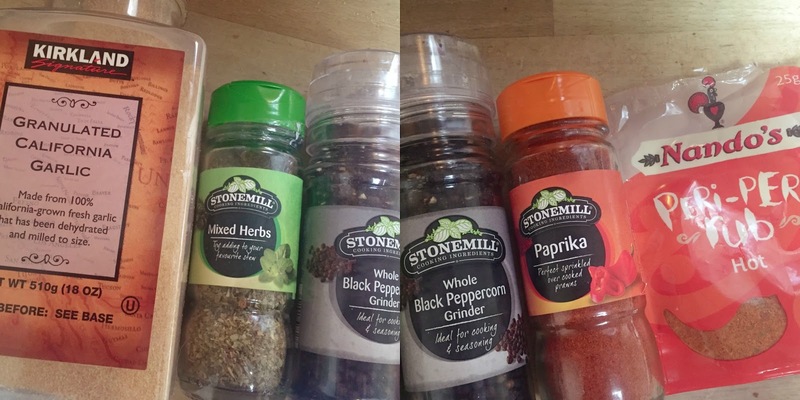 Spices and seasoning of your choice. You'll want pretty much equal parts Sweet Potato to Chickpeas and you'll need to mash them both. 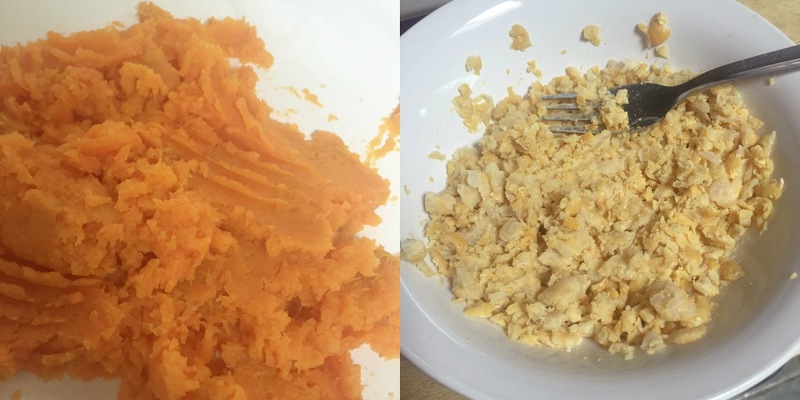 To mash my sweet potato. I pricked it with a fork a few times, then wrapped it in a damp paper towel and microwaved on high for 10 minutes, this makes it go super soft, you can literally cut it in half and scoop the middle out and mash with a fork. I don't recommend boiling the sweet potato before mashing as too much water will make the burgers difficult to form together. I used about 2/3 of a can of Chickpeas in water (this was a 400g can) and also microwaved these in the water for a couple of minutes just to soften them, then drained and dried really well and also mashed with a fork. I mashed mine quite coarsely as you can see as I actually like a few lumps for texture, but you can mash them up more depending on what you prefer. After you've mashed the ingredients separately, you'll want to roughly mixed them together slightly. Then, add your spices, I added Garlic, Mixed Herbs, Ground Black Pepper, Paprika and Nandos Hot Peri Peri rub (this is 100% vegan, I checked!!) and mix those all in. You can then form them into little burgers as I've done above. I made 6 small burgers but you could make 3 or 4 larger ones if you prefer. I then popped these to one side while I prepared the sides. For the Roasted Chickpeas and Veggie Crisps, I used pretty much the exact same method on both. For the Chickpeas, I used whatever was left from the can I used to make the burgers and tossed them in a little oil (I used coconut oil as it hasn't got a strong flavour, but you can use any) then seasoned with salt, pepper and chilli powder. For the Veggies, I used Frozen Broccoli and Cauliflower (defrosted and dried off) I used coconut oil again (I'd used way too much in the picture, I did have to drain some as too much oil can make them soggy) then seasoned with salt, pepper and garlic. I then put everything (included the burgers) in the oven for around 25 minutes at 220 degrees (Celsius) flipping everything halfway through. You'll want to keep an eye on this, as the Chickpeas can burn really easily. Don't worry if the Broccoli and Cauliflower look slightly burnt, they actually taste really good when they're blackened slightly. These will be crunchy with just a little softness to them and the Chickpeas will be completely crunchy, making both of these fab for anyone who loves crisps. As you can see from the first photo, I served this with a sauce, you can use whatever sauce you like, Sweet Chilli would work well but I used the Nandos Medium Peri Peri sauce. This is definitely vegetarian but I'm not 100% sure if it's vegan or not, so if anyone knows, please enlighten me! Again, let me know your thoughts, I'm loving doing these types of posts, so I'd love to hear what you think! *WHY DO GOOD GIRLS FALL FOR BAD GUYS?